Photographers E.T. Whitney and an assistant having lunch at the destroyed, temporary Confederate R.R. spur near Mitchel's Ford in March 1862. The American Civil War was the fifth war in history to be photographed, and was the most widely covered conflict of the 19th century. The images would provide posterity with a comprehensive visual record of the war and its leading figures, and make a powerful impression on the public. Something not generally known by the public is the fact that roughly 70% of the war's documentary photography was captured by the twin lenses of a stereo camera. The American Civil War was the first war in history, whose intimate reality would be brought home to the public, not only in newspaper depictions, album cards and cartes-de-visite, but in a popular new 3D format called a "stereograph" or "stereocard." Millions of these cards were produced and purchased by a public eager to experience the nature of warfare in a whole new way. The American Civil War (1861–65) was the fifth war in history to be photographed, the first four being the Mexican-American War (1846–48), the Crimean War (1854–56), Indian Rebellion of 1857 and the Second Italian War of Independence (1859). Mathew B. Brady (1823?-1896), the son of Irish immigrants, was born in Warren County, New York. Brady would spend his fortune to accumulate photos of the war. In the early 40s, Brady was a manufacturer of "jewel cases" for daguerreotypes in New York City. By 1844 he had opened his own daguerreian gallery at 205 Broadway, the "New-York Daguerreian Miniature Gallery", having with Edward Anthony in 1840 received instruction from Prof. Samuel B. Morse for a fee of $50. Still in his 20s, Brady's next goal was to establish at his gallery a hall of fame, a Gallery of Illustrious Americans. "From the first, I regarded myself as under obligation to my country to preserve the faces of its historic men and mothers." Brady returned to New York in May 1852 after a long absence in Europe. While there he sought treatments for the ill effects of mercury poising, a common occurrence among daguerreians. In 1856, seeing the tremendous potential for reproducible and enlarged prints and illustrated newspapers, Brady hired photographer and businessman, Alexander Gardner, who instructed him in the new art of wet-plate collodion photography. Mathew Brady's unequaled fame derived from his shrewd ability at self-promotion and a strong determination to succeed as the foremost portrait photographer of his day. He would also come to be known as the most prominent photographer of the American Civil War. From the very beginning Brady determined to accumulate as many war views as possible, with the understanding that in the not too distant future a photomechanical means of reproduction would be possible. With this end in mind, Brady bought, exchanged, borrowed, acquired and copied prints and negatives. If there were duplicate views to be had, he bought those. In light of Brady's practice, it is not surprising therefore, that a very large number of war views that were not actually his came to be associated almost exclusively with his name. Nearly every photograph associated with the struggle seemed to be a "photograph by Brady." At the beginning of the war, Mathew Brady secured the necessary permissions from the War Department, purchased rugged cameras and traveling "darkrooms", and sent his employees out to begin documenting the struggle, all at his own personal expense. The First Battle of Bull Run provided the initial opportunity to photograph an engagement between opposing armies, however Brady returned with no known photographs from the battlefield. Following the Federal rout, he arrived back in Washington D.C. the day after the battle and was photographed at his studio wearing a soiled duster and sword (see photo). Tantalizingly little is known about Brady's life, as he kept no journals, wrote no memoirs and left but few written accounts. By war's end, Brady estimated he had spent $100,000 to amass more than 10,000 negatives that the public no longer showed an interest in. In 1875, the War Department came to Brady's relief and purchased, for $25,000, the remainder of his collection, which were mostly portraits. Anthony Co. possessed most of Brady's war views, received by them as compensation for Brady's continued indebtedness. From the War Department, the collection went to the U.S. Signal Corps, and in 1940 it was accessioned by the National Archives. On January 15, 1896, Brady died penniless in the charity ward of Presbyterian Hospital in New York City. However, in his last days, Brady did not die in isolation. He was visited and comforted often, by friends and admirers up until the very end. His funeral was largely financed by the friends of his adopted regiment, the 7th NYSM. While it is true that in the beginning, the enterprising Mathew Brady secured the necessary permissions from the War Department for the purpose of documenting the "rebellion", while personally financing and directing the endeavor, it would be others, particularly those photographers who were under the direct supervision, or were employed by Alexander Gardner, such as Timothy O'Sullivan, James Gibson, George Barnard, James Gardner and William Pywell, who would follow the fate of the armies, and ultimately fulfill the difficult task of recording for posterity a timely, consecutive photographic history of the American Civil War. Alexander Gardner (1821–1882) was born in Paisley, Scotland. He became an apprentice silversmith jeweller at the age of fourteen. In his youth, Gardner found out that his interests and talents lay in finance, journalism and photography. Deeply disturbed by the exploitation of the working class, and in the spirit of the early cooperative movements in Scotland, Gardner conceived of a like-minded utopian venture in the US called the "Clydesdale Joint Stock Agricultural and Commercial Company" in Iowa. By 1853, many at the Iowa colony were sick and dying of tuberculosis, then called "consumption", and the Clydesdale company was dissolved. In 1856 Gardner emigrated to America with his family and sought out the renown Mathew Brady for employment and was hired to manage Brady's Washington D.C. Gallery. Gardner's business acumen and expertise at wet-plate collodion photography and the "Imperial Print", a 17 by 21 inch enlargement, brought Brady enormous success. The developed plates, which had typically been used as positives to create individual portraits called ambrotypes, were now being widely used as negatives, which employed the use of sensitized papers, making possible the production of unlimited copies of stereocards, album cards, and the increasingly popular "carte-de-visite", or visiting card. In November 1861 Gardner was appointed to the staff of General George McClellan, the commander of the Army of the Potomac, and was given the honorary rank of captain. In 1862, Gardner and/or his operators photographed the 1st Bull Run battlefield, McClellan's Peninsula Campaign, and the battlefields of Cedar Mountain and Antietam. Since the battlefields of Fredericksburg and Chancellorsville were Union defeats and remained in enemy hands, Northern photographers were unable to reach the fields. By May 1863, Gardner had opened a gallery with his brother James, taking with him many of Mathew Brady's former staff. The circumstantial evidence suggests that Gardner's split with Brady was not caused by any altruistic concerns over the proper recognition of the photogrphers in published works. Gardner himself in 1867 stated in a deposition that although a photograph was identified on the mount as a "Photograph by A. Gardner", it simply meant that it was printed or copied in his gallery, and he was not necessarily the photographer. The split seems to have grown out of Brady's incompetent business practices and his failure to regularly meet his payroll. In July, Gardner and employees James Gibson and Timothy O'Sullivan photographed the battlefield of Gettysburg, Pennsylvania. Grant's Overland Campaign and Petersburg operations were mostly photographed by Gardner's employee Timothy O'Sullivan, at a time when the designation of official photographer for Grant's headquarters command had devolved to Mathew Brady. In April 1865, Gardner photographed Lewis Powell, George Atzerodt, David Herold, Michael O'Laughlen, Edman Spangler and Samuel Arnold, who were arrested for conspiring to assassinate President Abraham Lincoln. Gardner, with the assistance of O'Sullivan, also took photographs of the execution of Mary Surratt, Lewis Powell, George Atzerodt and David Herold as they were hanged at Washington Penitentiary on July 7, 1865. Four months later, Gardner photographed the execution of Henry Wirz, commanding officer at the infamous prisoner of war camp in Andersonville, Georgia. In 1866, "Lincoln's favorite photographer" published his two-volume anthology, Gardner's Photographic Sketch Book of the War. Two editions were published in 1865 an 1866, consisting of two leather-bound volumes. Each volume contained 50 tipped-in, imperial size albumen prints, with an accompanying page of descriptive, letterpress. However, at $150 per set, it was not the success Gardner had hoped. When asked about his work he said, "It is designed to speak for itself . . As mementos of the fearful struggle through which the country has just passed, it is confidently hoped that it will possess an enduring interest." In 1867 Gardner closed his gallery, and with his son Lawrence and assistant William R. Pywell set out to photograph along the proposed route of the U.P.R.R., taking photographs along the 39th parallel. The result of Gardner's journey from Wyandotte, Kansas to Fort Wallace in west Kansas was the folio sized anthology, Across the Continent on the Union Pacific Railway, Eastern Division. In 1875 the civic-minded Gardner worked at the D.C. Metropolitan Police Dept. copying nearly a thousand daguerreotypes to be used as "mug shots", the forerunner of the "Rogues Gallery." In 1879, Alexander Gardner formally retired from photography, devoting his remaining years to the Washington Beneficial Endowment Association, the Masonic Mutual Relief Association and the St Andrews Society, a Scottish relief organization. Ruined roundhouse in Atlanta, Georgia after the Atlanta Campaign. Albumen print by George Barnard, 1866. Digitally restored. A distinctive attribute of Barnard's work was to superimpose clouds into an otherwise overexposed sky. George Norman Barnard (1819-1902) was born in Coventry, Connecticut, and as a child moved to upstate New York. After a brief career in hotel management, he opened a daguerreotype studio in Oswego, becoming nationally known for his portraits. It is not known where Barnard learned his trade. On July 5, 1853, Barnard photographed the conflagration at the Oswego flour mills, producing what may be the first American "news" photograph. In 1854 he moved his operation to Syracuse, New York, and began using the wet-plate collodion process. In 1859, Barnard joined Edward Anthony's firm. At the outbreak of war, Barnard was working for Mathew Brady in New York City and Washington D.C. Barnard, besides doing portraits and photographing the troops around Washington D.C., was among Brady's initial corps of photographers, who were sent into the field to photograph the battlefields of Northern Virginia, and the Peninsula, including Bull Run and Yorktown, as well as Harper's Ferry. Barnard is best known for his 1866 masterpiece, Photographic Views of Sherman's Campaign, which contains 61 Imperial size, albumen prints embracing scenes from the occupation of Nashville, the great battles around Chattanooga and Lookout Mountain, the campaign of Atlanta, the Great March to the Sea, and the Great Raid through the Carolinas. He continued to photograph after the war, operating studios in Charleston, S.C. and Chicago. His Chicago studio was destroyed by the historic fire of 1871. In 1880 Barnard sold his Charleston studio and moved to Rochester, New York, where he became the distinguished spokesman for a young George Eastman's new line of photographic supplies. Barnard died in Syracuse, New York at the age of 82. Incidents of the war: "The Harvest of Death", Gettysburg, July, 1863"
Timothy H. O'Sullivan (1840-1882) was born in New York City. As a teenager, he was employed by Mathew Brady and worked for him continuously from 1856 to late 1862, when he was hired by Alexander Gardner as "superintendent of my map and field work." In the winter of 1861-62, O'Sullivan was dispatched to document Gen. Thomas W. Sherman's Port Royal, S.C. operations. In July 1862, O'Sullivan followed the campaign of Gen. John Pope in Virginia. In July 1863, he reached the pinnacle of his career when he took pictures at Gettysburg, PA., most notably, "The Harvest of Death". In 1864, following Gen. Grant's trail, he photographed during the Siege of Petersburg and the siege of Fort Fisher. That brought him to Appomattox Court House in April 1865, and back to Petersburg in May. Fully 45 of the 100 prints in Gardner's Photographic Sketch Book Of The War are credited to O'Sullivan. At the end of the Civil War, O'Sullivan was made official government photographer for the King (1867, 68, 69, 72), Darien (Panama 1870) and Wheeler (1871, 73, 74) Expeditions respectively, during which time he married fellow photographer, William Pywell's sister Laura in 1873. O'Sullivan's pictures were among the first to record the prehistoric ruins, Navajo weavers, and Pueblo villages of the southwest, and were instrumental in attracting settlers to the West. In 1875 O'Sullivan returned to Washington, D.C. where he spent the last years of his short life as the official photographer of the Treasury Department. Just seven years later, at the young age of 42, O'Sullivan died of tuberculosis at his parent's home in Staten Island, New York. James F. Gibson (1828/29-? ), perhaps the least recognized of the war's most significant photographers was also one of the least known. In 1860, Scotsman Gibson's name appeared with that of his wife Elizabeth in the Washington D.C. census, and the city directory showed that Mathew Brady employed him. Gibson may have emigrated to America with Alexander Gardner, who was also from Scotland. Gibson's first documented trip into the field was when he accompanied George N. Barnard to the Bull Run battlefield in March 1862. He worked with Gardner at Gettysburg and partnered with him at Sharpsburg, but Gibson's own greatest legacy was the wide array of photographs he took while on the Virginia peninsula, in particular his poignant, landmark photo of the wounded at Savage's house (Savage Station, Virginia). Several years after the war, before a court could rule on Gibson's civil suit against business partner, Mathew Brady (Gibson also sued Gardner), he heavily mortgaged Brady's failing Washington Gallery, which he managed, left for Kansas with the cash, and was never heard from again. Andrew Joseph Russell (1829 - 1902), was born in Walpole, New Hampshire, the son of Harriet (née Robinson) and Joseph Russell. He was raised in Nunda, New York. He took an early interest in painting, and in addition to executing portraiture for local public figures, he was drawn to railroads and trains. During the first two years of the Civil War, Russell painted a diorama used to recruit soldiers for the Union Army. On 22 August 1862, he volunteered at Elmira, New York, mustering in the following month as a captain in Company F, 141st New York Volunteer Regiment. In February 1863, Russell, who had become interested in the new art of photography, paid free-lance photographer Egbert Guy Fowx $300 to teach him the wet-plate collodion process. Capt. Russell's first photographs were used by Brigadier General Herman Haupt to illustrate his reports. Impressed with his work, on 1 March 1863, Haupt arranged to have Russell detached from his regiment and assigned to the United States Military Railroad Construction Corps, making Russell one of only two, Federal non-civilian Civil War photographers (Pvt. Philip Haas). In his embedded capacity, Russell not only photographed transportation subjects for the War Department, but also likely moonlighted by selling battlefield negatives to the Anthonys. In fact, Russell took over a thousand photos in two and a half years, some of which were distributed exclusively to President Lincoln. He's probably best known for "Stone wall at foot of Marye's Heights, Fredericksburg, Va." showing dead Confederates of Barksdale's brigade, during the battle of Chancellorsville. Dead Confederate soldier inside Fort Mahone, Petersburg, Virginia - T.C. Roche, April 3, 1865. Thomas C. Roche (1826 - 1895) In 1858, Roche became interested in photography and was listed as an agent at 83 South St. in Brooklyn, New York. In 1862 he went to work for Anthony Co., taking the first complete set of Central Park stereoviews published by them. Many, early Anthony stereoviews by Roche were published on fragile glass which, not surprisingly, are today extremely rare. Over the years, Roche became one of the Anthony Co.'s most valuable assets, developing many products and processes for the company. One such product patented by Roche under Anthony in 1881, was the "dry plate", which signaled the end of "wet plate" photography. Roche lived well off his many royalties, and continued as technical advisor to the company up until his death in 1895. Roche is probably best known for, and counts among his many accomplishments, the roughly 50 stereoviews taken on April 3, 1865 following the fall of Petersburg, Virginia. These include at least 20 stereoviews of the dead, taken inside Fort Mahone, better known as "Fort Damnation" by Federal troops. The War Department contracts guaranteed the Anthonys the stereo negatives, while furnishing the government with the large format plates. Jacob Frank "Jay" Coonley (1832-1915) New York Ambrotypist, Coonley was originally a landscape painter who early on learned the trade from George N. Barnard. He managed Edward Anthony's stereoscopic print shop until 1862, taking assignments in Pennsylvania, New York and Washington D.C. When war erupted, Coonley remained in Washington, photographing generals soldiers, statesman and the like. In 1862 he briefly moved to Philadelphia to open the portrait gallery partnership of Coonley & Wolfsberger. Six month later, Coonley was back in New York managing Clarke's Union Gallery, corner of Broadway and Bleecker St. In 1864, he was awarded a contract by Quartermaster General Montgomery Meigs, for photographic work along the lines of the railroads in US. possession, in Alabama, Georgia and Tennessee. During this time, Coonley also produced the Nashville series for Edward Anthony. Coonley was also very likely responsible for at least fourteen photos archived at the Library of Congress, depicting the April 14, 1865, Fort Sumter Flag-Raising Ceremony, though he's cited as the author of just one. The photographic evidence suggests the Anthony Co. photographer used a stereo camera with a drop-shutter, utilizing two camera locations inside the fort. The only view inside Fort Sumter that actually depicts the garrison flag being raised is the work of photographer William E. James. From 1865-71 Coonley managed C.J. Quinby's Charleston, S.C. gallery, with George N. Barnard joining as a partner in 1868. Some years later,Cooley spent time in Nassau, Bahamas, at the request of Governor-General, Sir William Robinson. He returned to New York in 1881 and took a position as operator for J.M. Mora. In 1886 Coonley returned to Nassau, establishing a successful business there until 1904, when he sold out and returned to New York. Seventy-two year old Coonley would continue to spend his winters in the Bahamas. Samuel Abbot Cooley (?-1900) worked as a sutler and photographer for X Corps, employing his large format, drop-shutter and twin lens stereo cameras. In 1865 he opened a mercantile in Beaufort, S.C., simultaneously advertising himself as "Photographer, Department of the South", though he only did contract work for the government. Cooley had galleries in Hilton Head, S.C. and Jacksonville, Florida. In 1866 he had established himself as an auctioneer and town marshall in Beaufort. He eventually returned home to Hartford, Connecticut in 1869, where he offered at his gallery, an "exhibition of beautiful Stereopticon Views." In 1865, Reekie was an officer of the Saint Andrews Society, a Scottish relief organization in Washington D.C., as was Alexander Gardner. David B. Woodbury (1839-1866) was arguably the best of the artists who stayed with Brady through the war. In March 1862, Mathew Brady sent Woodbury and Edward Whitney out to photograph the 1st Bull Run battlefield, and in May, views of the Peninsula Campaign. In July 1863, Woodbury and Anthony Berger photographed the Gettysburg battlefield for Brady, returning on November 19 to take "pictures of the crowd and Procession" (Nov. 23, 1863 letter to sister Eliza). In the summer of 1864, Woodbury photographed Grant's Headquarters Command for Brady, who had replaced Alexander Gardner as official photographer. On April 24, Woodbury assisted J.F. Coonley on the steps the Treasury Building, for the purpose of photographing the Grand Review of the Army, "the plates being exposed with a drop shutter, this being the nearest thing to an instantaneous exposure with a wet plate." Information on Alexander Gardner's photographer, David Knox (?-?) is extremely scant. Scotsman, Knox was first employed by Mathew Brady and later by Alexander Gardner. Knox is best known for his plate, "13 inch mortar Dictator, in front of Petersburg, Va." Four of Knox's negatives were included in "Gardner's Photographic Sketch Book of the War." David Knox was an officer of the Saint Andrews Society, a Scottish relief organization in Washington D.C.
William Redish Pywell (1843-1887) worked for both Mathew Brady and Alexander Gardner. Pywell's photographs are an important and integral part of the historic photographic record of the American Civil War. Three fine negatives are credited to Pywell in Gardner's Photographic Sketch Book of the War. Pywell was busy in both the Western Theatre as well as in the East, but is probably best remembered for his early photographs of the slave pens of Alexandria, Va. Between September and October 1867, Pywell assisted Alexander Gardner during the "Kansas Pacific Railway Survey" across the 39th parallel, from Wyandotte, Kansas to Fort Wallace in western Kansas. The result would be Gardner's folio sized album Across the Continent on the Union Pacific Railway, Eastern Division. William Frank Browne (?-1867) After the end of his two-year enlistment with the 15th Vermont in August 1863, Brown began working as camp photographer for the 5th Michigan Cavalry, part of George A. Custer's Michigan brigade. In 1864-65 Browne did contract work for Alexander Gardner. In May 1865, Maj. General Henry H. Abbot assigned Browne to photograph the James River water batteries around Richmond, Va., thus "preserving an invaluable record of their wonderful completeness." After the war, Gardner published 120 of Browne's negatives as "View of Confederate Water Batteries on the James River." Browne returned to his native Northfield, Vt., where he died of consumption (tuberculosis) in 1867. Isaac Griffith (1833-1913) and Charles John (1838-1906) Tyson. Though residents of Gettysburg in July 1863, the Tysons' "Tyson's Excelsior Photographic Gallery" wasn't as yet properly equipped to take photographs in the field, for which there was basically no demand at the time. The Tysons evacuated town, as did most of the residents, prior to the Rebel shelling and occupation on July 1. Soon after Gardner's and Brady's July visits, the Tyson brothers were making their own lucrative stereoviews of the battlefield. On November 19, the brothers would record their historic views of the procession to the dedication of the Soldier's National Cemetery, one of which captured President Lincoln on horseback. George Stacy (1831-1897) George Stacy was a Civil War, field photographer and later a prolific publisher of stereoviews, not necessisarily his own. It is not known exactly where the Maine native learned his trade. The earliest confirmed Stacy, stereoviews are a series he took of the Prince of Whales' visit to Portland, ME. Oct. 20, 1860, and the renowned Fortress Monroe series in June 1861. An industry census shows that Stacy was still marketing his stereoviews in 1870. By 1880 he had taken up horticulture in Patterson N.J.
Frederick Gutekunst (1831-1917) Leading, Pennsylvania photographer, Gutekunst opened two studios in Philadelphia in 1856. On July 9, the same day that Alexander Gardner's photographers days after the Battle of Gettysburg, the "Dean of American Photographers" produced a series seven plates of exquisite quality, including the first image of local hero John Burns. A portrait of Gen. Ulysses S. Grant stirred national interest and helped set Gutekunst apart from his contemporaries. By 1893 Gutekunst had been in business almost forty years and was residing in the upscale suburb of Germantown. Gutekunst suffered from Bright’s Disease, which may have precipitated a fall down some stairs eight weeks before his death. Edward Tompkins Whitney (1820-1893) In 1844, Whitney quit the jewelry business to learn the daguerreotype process from M. M. Lawrence, and in 1846 moved to Rochester, New York to open a gallery. In 1850 J. W. Black of Boston instructed Whitney in the "new art" of wet-plate collodion photography. In 1959, after recovering from the ill effects of cyanide poisoning, Whitney sold his Rochester business and moved to New York City, opening a gallery at 585 Broadway with Andrew W. Paradise, Mathew Brady's "right-hand man." Nevertheless, during the winter of 1861-62, Brady would commission Whitney to take "views of the fortifications around Washington and places of interest for the Government." These would include scenes in and around Arlington, Falls Church and Alexandria, VA. In March 1862, Brady again dispatched Whitney and Brady operator, David Woodbury, to take photographs on the Bull Run battlefield. Whitney also relates that he took views at Yorktown, Williamsburg, White House, Gaines' Mill, and Westover and Berkeley Landings during McClellan's Peninsula Campaign. Whitney personally appears in an unusually large number of photographs from 1861–62, and while there is no question that Whitney took photographs for Brady, alas, none are specifically ascribed to him. After Whitney's last documented presence with Mathew Brady at Brunswick, MD. in October 1862 he's listed as working with a Mr. Beckwith in Norwalk, CT. from 1865-71, and alone in Norwalk from 1873-80, and lastly in Wilton, CT. from 1879-86. Jeremiah Gurney (1812-1895) was born in Coeymans, New York. Gurney, then a jeweler in Saratoga, N.Y. became one of the first, if not the first student in America to learn the "new art" of daguerreian photography. Gurney was taught the process by Samuel F.B. Morse in 1839, who explained to Gurney that "What you will have to allow for is the initial outlay . . And there is of course my fee." The fee was thought to have been fifty dollars. Gurney was not listed in the New York city directories until 1843, when he appears as a daguerreian at 189 Broadway. In the 1850s "Gurney's Daguerreian Gallery" offered mammoth daguerreotype prints from double full size plates. In 1852, he took time off to recover from a common illness of the daguerreian trade, mercury vapor poisoning. In 1857 Gurney was listed in the New York City Directory at 359 Broadway, in partnership with C.D Fredericks. In 1860, he was listed as a "photographist" at 707 Broadway, in business as "J. Gurney and Son." Gurney and son Benjamin advanced paper photography with the use of the "Chrystalotype" process. Jeremiah Gurney is probably best known for his having taken a photograph of Abraham Lincoln in an open coffin April 24, 1865, as the President's body lay in state in City Hall, New York City. The episode caused much distress to Mary Lincoln, who had forbid the taking of any photographs of her husband's corpse. Secretary of War Edwin Stanton was furious and succeeded in confiscating all of the existing prints and negatives but one. In 1874 Gurney's partnership with his son was dissolved. In April 1895, Jeremiah Gurney began a journal that was later gifted to the New York Historical Society by the photographer's great-great grandniece, Miss Elizabeth May Possons. George Oscar Brown (1844-?) active 1866-1889. Information on Brown is extremely scant. In April 1866, under the direction of Dr. Reed Bonteceau, Brown, at the time just a hospital steward at the Army Medical Museum in Washington D.C, was hired as an assistant cameraman by the museum's photographer, William Bell. The assignment was to document medical specimens (bones, skulls &c.) on the Wilderness and Spotsylvania battlefields of Virginia. Though new to the field of photography, Brown did respectable work, producing a number of stereo photographs that have aided in our comprehension of those terrible battles. In the 1868 census, Brown was listed as a photographer at the Medical Museum. By 1870, Brown was promoting and instructing others in the use of the "Porcelain Print" process, which was patented by photographer Egebert Guy Fowx. Brown's trail is lost after 1873, when the Baltimore census lists him as the Secretary of The Maryland Photographic Association. The natural disappointment in the South at the end of the war was such that photographers were forced to destroy all negatives, just as owners destroyed all the objects that might serve as souvenirs or relics of the terrible struggle, thinking for the moment at least, that they could not bear the strain of brooding over the tragedy. The most renowned Southern photographer was George Smith Cook (1819-1902). The native of Stamford, Connecticut was not successful in the mercantile business, so he moved to New Orleans and became a portrait painter. This proved unprofitable and in 1842 Cook began working with the "new art" of the daguerreotype, settling in Charleston, South Carolina, where he raised a family. Cook's status as one of the South's most famous photographers was due in part to his visit to Fort Sumter on Feb. 8, 1861, which resulted in the first mass marketing of cartes-de-visite, a photograph of the fort's commander, Maj. Robert Anderson. A successful portrait business that survived the war, and the systematic documentation of Union shelling of Charleston and in particular, Fort Sumter added to Cook's fame. Then, on September 8, 1863 he and business partner James Osborn photographed the inside of Fort Sumter, and as luck would have it, also captured the developing naval action in the harbor, Federal ironclads firing on Fort Moultrie. The historic images depict three ironclad monitors and U.S.S. New Ironsides firing on Fort Moultrie in defense of monitor U.S.S. Weehawken, grounded off Cummings Point. For unknown reasons, the historic stereoview was not marketed until 1880, when it was finally offered for sale by Cook's son, George LaGrange Cook. Sadly, Cook's extensive collection, mainly consisting of portraits of notable Southern personalities, was lost on Feb. 17, 1865, when his Columbia, S.C. studio was destroyed during the firestorm that engulfed the capitol city. Cook moved his family to Richmond in 1880, and his older son, George LaGrange Cook, took charge of the studio in Charleston. In Richmond, Cook bought up the businesses of photographers who were retiring, or moving from the city. He thus amassed the most comprehensive collection of prints and negatives of the former Confederate capital known to exist. Cook remained an active photographer for the remainder of his life. His younger son, Huestis Cook, eventually went into business with his father. After his brother George's death on November 27, 1902, Huestis took over the Richmond studio. Note: The famous "exploding shell" photo falsely attributed to Cook is in reality a painting by C.S.A. Lt. John R. Key, based on three half stereos taken by Cook inside Fort Sumter on Sept. 8, 1863. Experts had overlooked the fact that no camera of the time was capable of taking the wide angle depicted. In 1858, James M. Osborn (1811-1868), a 47 year old daguerreian, native of New York, living in Charleston, S.C., joined forces with 22 year old Charleston native, Frederick "Eugene" Durbec (1836-1894). Both were soon to become among the war's first photographers. By 1860, from their state-of-the-art, high-volume studio, they had reached a national audience with their advertised "largest and most varied assortment of steroscopic instuments and pictures ever offered in this country." By then, both had joined the Lafayette Artillery, Durbec having risen to the rank of colonel. It was also at this time that O&D produced documentary photographs of the city and its vicinity, including their singularly historic, antebellum scenes of plantations and slave life. Following the Federal surrender of Fort Sumter on April 14, 1861, Osborn would visit the fort and its surrounds on at least two occasions, taking at least 43 stereo images of the battle's aftermath, in what is the largest known group of Confederate images of the war, and which is considered the most comprehensive photographic record of a Civil War engagement ever made. Today, thirty-nine are known to exist. Their friendship would outlast their Charleston business however, which the war and damaging fires had brought to an end by February 1862. Then, in September 1863, in response to Gen. Thomas Jordan's desire to document what "Southern troops could endure", Osborn and fellow artist George S. Cook volunteered to photograph the interior of Fort Sumter, which had been shelled by Union batteries into a shapeless mass. Little did the enterprising partners know that one result of this visit would be the first combat photographs in history. Jay Dearborn Edwards (1831-1900), a New Hampshire native, was born Jay Dearborn Moody, on July 14, 1831. After the death of his father in 1842, young Jay was sent to St. Louis to live with an aunt, at which time his surname was changed to Edwards. By age 17, he was a lecturer on the pseudoscience phrenology, and apparently also began his photographic career, operating a daguerreian studio at 92-1/2 Fourth Street. In 1851, he and his aunt moved to New Orleans, and Jay quickly established himself at 19 Royal Street. He preferred working outdoors in his "queer-looking wagon." The new art of wet-plate photography enabled Edwards to distribute his stereoscopic views images throughout New Orleans. Because his stereo cards had a P.O. box number imprinted on the backs, historians have concluded he did not operate his own gallery in New Orleans. However, that changed when he and E. H. Newton Jr. formed a partnership and opened the Gallery of Photographic Art, located at 19 Royal Street. The gallery specialized in "stereoscopic views of any part of the world," and was assisted by New York publisher Edward Anthony and the London Stereoscopic Company. Their diverse inventory included an array of photographic equipment, photographs, ambrotypes, melainotypes, portrait enlargements, pastel, oil, and watercolor prints. Edwards undertook one of the earliest wartime photo expeditions by venturing into the field in April 1861. He followed Confederate units from New Orleans to Pensacola, Fl., as they mobilized against Fort Pickens. Edwards advertised 39 views at "$1 per copy." Two were reproduced as woodcuts in Harper's Weekly in June, though Edwards received no credit. Afterwards, Edward was apparently out of business. William D. McPherson (?-?) and Mr Oliver (?-?) The southern photographers were active in New Orleans and Baton Rouge, Louisiana, in the 1860s, and operated a gallery in New Orleans, La., at 132 Canal Street. McPherson & Oliver's business was exclusively Confederate, until Union forces occupied Baton Rouge in May 1862. Like other Southern photographers in occupied cities, the pair quickly adapted to the occupation. This arrangement had the benefit of being able to procure photography supplies through special arrangements with the military. The pair went to Port Hudson, La. in the summer of 1863 and photographed the hard-fought siege of that city. After the fall of Port Hudson on July 8, McPherson & Oliver photographed the captured, Confederate fortifications. In August 1864, following the capture of Fort Morgan on Mobile Bay, Alabama, McPherson & Oliver made a comprehensive photographic record of that installation. McPherson & Oliver are best known for "The Scourged Back", their sensational, widely published portrait of "Gordon", an escaped slave from a Louisiana plantation. Confederate Lieutenant Robert M. Smith was captured and imprisoned at Johnson's Island, Ohio. He is unique in that he was able to secretly construct a wet-plate camera using a pine box, pocket knife, tin can, and spyglass lens. Smith acquired chemicals from the prison hospital to use for the photographic process. He used the camera clandestinely to photograph other prisoners at the gable end of the attic of cell block four. Itinerant (traveling) photographers received permission from a commanding general to establish themselves within an encampment, primarily for the lucrative purpose of making portraits for the soldiers, which could then be sent to loved ones as a memento. In September 1862, Northern photographic studios were required to purchase an annual license. By August 1864, photographers would have to buy revenue stamps as well. The "Sun Picture" tax on photographs was instituted by the Office of Internal Revenue as a means to help finance the war. The tax was either 1¢, 2¢, 3¢, or 5¢, depending on the price of the photo (1-10¢, 10-25¢, 25-50¢, 50-$1 respectively). Largely due to the lobbying efforts of Alexander Gardner, Mathew Brady, Jeremiah Gurney and Charles D. Fredericks, the tax was repealed in 1866. In 1854, James Ambrose Cutting and his partner, Isaac A. Rehn, took out three patents that were improvements in the wet-plate collodion process. Numerous high-profile lawsuits (E. Anthony, J. Gurney, C.D. Fredericks, J. Bogardus) and disputes surrounding the patents may have had an intimidating effect, and discouraged a wider use of "instantaneous" (stop action) photography during the Civil War. Cutting's patented formula featured the chemical component, bromide of potassium, which greatly enhanced the sensitivity of the collodion. When the patent extensions came up for renewal in 1868, the Patent Office decided that the original patents should not have been issued, and the extension was denied. The decision was partly based on evidence found in Henry Snelling's book, "The History and Practice of Photography." Snelling in 1853 had described the use of the same key ingredients found in Cutting's high-speed, emulsion. Another widespread concern of 19th century photographers was the lack of copyright protection, something the Philadelphia Photographer termed "piratical stealing". In 1870 H.R. 1714 was passed by the 41st Congress. The interpolations made in the new law were due primarily to the influence of Alexander Gardner. The results of the efforts of all Civil War photographers can be seen in almost all of the history texts of the conflict. In terms of photography, the American Civil War is the best covered conflict of the 19th century. It presaged the development of the wartime photojournalism of World War II, the Korean War, and the Vietnam War. The number of Civil War photographs that are available contrasts sharply with the scarcity of pictures from subsequent conflicts such as the Russian wars in Central Asia, the Franco-Prussian War, and the various colonial wars before the Boer War. ↑ "The Blue & Gray In Black & White", Bob Zeller 2005, pg. 66. ↑ "The Blue And Gray In Black And White", Zeller, Bob, 2005, pp. 44-46. 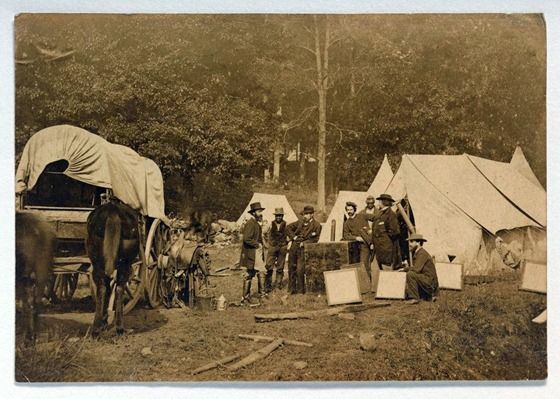 Center for Civil War Photography - The only clearinghouse for information about Civil War photography on the Internet. Huntington Digital Library, James E. Taylor Scrapbook Collection - Taylor (1839–1901) was an illustrator for Leslie’s Illustrated Newspaper and an avid collector of Civil War prints for the MOLLUS, many of which have long since vanished, along with their negatives, and are today found only in these three scrap books. This page was last modified on 12 January 2016, at 22:05.